Got an hour to spare this fine Labor Day weekend? Head on over to Bloggingheads TV to catch my "diavalog" with fellow physics history buff George Johnson. (We eagerly await his forthcoming book on his 10 favorite physics experiments.) Future Spouse, who was Johnson's bloggy guest in July, kindly loaned me his Caltech office for the occasion. Tune in and you can hear me blather on about Tesla, Faraday, the cold fusion kerfuffle, gooey stuff, why I want my very own cloud chamber, and a few bits of gossip here and there just to add some spice to the mix. It's always a little unnerving to see a video of one's self -- unless it's something you do for a living, in which case, you probably get used to it. (Jen-Luc Piquant is a narcissistic anomaly: she would love nothing more than to watch video footage of her Cyberself all day long. Please don't indulge her.) Nothing brings out those tiny little flaws and annoying behavioral tics we're not even aware we possess like seeing them displayed on a monitor for all the world to view. I suffer from chronic "Hair Issues," for example: despite my best efforts, there's always a recalcitrant strand mucking up the overall effect -- in this case, falling repeatedly into my eyes. I also forgot to replace the swivel chair at Future Spouse's desk with a stationary one, and spent a good part of the hour-long discussion trying -- with minimal success -- not to swivel excitedly while I was talking. It was soooo tempting to just take a moment, push away, spin all the way around and squeal, "Wheee!" (Because I R Serius Science Writr, LOL.) Then there's the inevitable mis-statements when you're chatting off-the-cuff. The most egregious: (1) mentioning interferometry in relation to LIDAR when the two are completely unrelated, and (2) referring to UK scientist Simon Singh as Simon Schama (a historian whose new book, Rough Crossings, is the latest to start gathering dust on my groaning bookshelf until I find time to read it). Still, I can take comfort in the fact that I'm just a relatively obscure science author/blogger, so no one will care about the bad hair and chair-swiveling a week or so from now. I feel kinda bad for former president Abraham Lincoln: people are still harping on the poor guy's appearance almost 150 years after his assassination in 1865. Apparently the great man had a severe facial defect on the left side of his face -- cranial facial microsomia -- the result of either being kicked in the head by a horse as a child, or a developmental defect. It wasn't one of those trivial things, either: people noticed, even the ones who liked him. (His enemies, naturally, lost no opportunity to mock his appearance.) Novelist Nathaniel Hawthorne admired Lincoln greatly, but still described his "homely sagacity" and "sallow, queer, sagacious visage" for a magazine article -- comments that were deleted by the magazine's editor, who deemed them disrespectful, despite the references to Lincoln's wisdom. Other contemporaries commented on the fact that he was a bit cross-eyed -- his "left eye at times drifted upwardly independently of his right eye," a condition called strabismus in modern medicine. It can cause double vision, although today it can be treated through surgery. 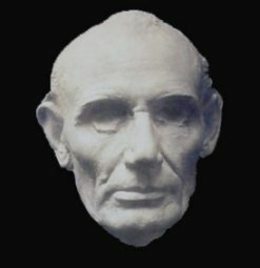 I had to look up a few images of Lincoln to see the condition for myself, because I didn't remember any major deformities: a large, hooked nose, certainly, and sad eyes in a heavily furrowed face, but I've always felt it was a beautiful face, perhaps because -- rather than in spite of -- its imperfections. The sculptor who created Mount Rushmore, Gutzon Borglum, disagreed with my assessment: he said the left side of Lincoln's face was "primitive, immature, and unfinished." Borglum was a man who cared deeply about image, and fostered his own meticulously: he lied about his age, and about his parentage. (He was the son of a Mormon bigamist who later abandoned his second wife and son to cleave monogamously to his first wife -- the two women were sisters.) 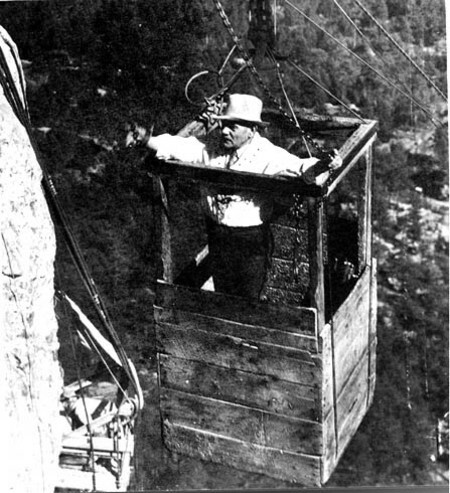 Fortunately for our national monument, he was equally meticulous about trekking all over Mount Rushmore to determine the best angles for each feature of the spotlighted presidents. Even though Borglum didn't live to see the completion of his greatest work, one suspects he may have "corrected" Lincoln's twisted visage somewhat; given the fact that he named his son Lincoln, he could have been a fan. Or not. Image is everything in modern medicine, too, except in medicine, it's about inner beauty -- literally. And that beauty is very much in the eye of the beholder, which, more often than not, is the team of doctors and technicians who do the imaging and analyze the results. It's important work that has saved a lot of lives over the decades, beginning with the discovery of X-ray imaging, all the way to modern magnetic resonance imaging (MRI). In between, you have computed tomography (CT) scanning, invented in England in 1972 by Godfrey Hounsfield. Wikipedia tells me that the CT scan is possibly the greatest legacy of the Beatles. The band made a fortune for EMI through their record sales, and EMI, rather surprisingly, turned around and poured some of those profits into scientific research. Hounsfield won the Nobel Prize in medicine in 1979, sharing the honor with American scientist Allan McLeod Cormack of Tufts University, who independently invented a similar process. Tomography is great because it uses digital geometric processing to produce 3D images of the inside of the body: the machine takes a series of 2D x-ray images via a rotating axis and then puts all the individual slices together to construct the final image -- kind of like putting together a 3D jigsaw puzzle out of X-rays. But when it comes to certain body parts -- say, the breasts -- CT scans have some challenges, particularly when it comes to mammography. Any Woman of A Certain Age would be happy to explain, in great detail, the discomfort of getting a mammogram: the breast must be pulled away from the body and "compressed" between two glass plates to make sure that the entire breast is imaged. It's like having each breast squeezed between a cold metal vise. "Discomfort" is putting it mildly: it can be downright painful. Which is why women are reluctant to have many of the exams, despite the dramatic reductions in the risk of dying from breast cancer to be realized from regular exams. It's not the best purview for looking deep inside the breast tissue -- and the deeper, the better, because cancer has a way of hiding deep down, and the earlier it's detected, the higher the rates of survival. So nowadays, medical practitioners are increasingly turning to digital tomosynthesis for imaging the breasts. Tomosynthesis actually predates CT scans slightly, employing the simple motion of a tube and a detector to create images at a given depth. It basically takes advantage of the parallax effect, in which an object that is closer appears to move a greater distance against the background, than an object that is further away, when viewed from various angles. But you could only see the anatomy at that depth; everything else was too blurred to be of much use, and the technique was quickly eclipsed by CT scanning. In recent years, it's come back into favor, and the new version is digital breast tomosynthesis (DBT). With this technique, you take many different x-ray images of each breast from many different angles. Breasts still need to be positioned the same way, but only a little pressure is required, just sufficient to hold everything steady during the procedure. The x-ray tube moves in an arc around the breast while the images are taken -- 11 in total, in a mere 7 seconds. That information is then sent to a computer, which lines up the separate images to produce a 3D image throughout the breast. No more overlapping structures capable of shielding elusive cancers! And, no more discomfort for the patients! Huzzah! The researchers who developed it, at Massachusetts General Hospital, have achieved very promising preliminary results and have submitted them to the FDA for approval. Clinical commercialization could ensue as early as 2008. It doesn't require lots of additional training or expensive new equipment, either, so it should be pretty easy to implement. Granted, it's a challenge to adequately image the breasts -- and anything that makes a mammogram more comfortable is a major breakthrough in my book -- but the brain is even more challenging. Functional magnetic resonance imaging is all the rage right now, for very good reason: it enables you to see how the brain behaves in real time, and is telling us all sorts of amazing things about how the brain works. Blood flow increases to certain parts of the brain when those sections are activated while the subject is performing various tasks, and those segments "light up" in the image. And such pretty images, too! When it comes to neuroscience, it's the surgeons who have the image problems, at least according to neurosurgeon Katrina Firlik, author of Another Day in the Frontal Lobe ( a terrific read, highly recommended -- especially the anecdote about opening up the skull of a long-neglected homeless patient and seeing a living maggot wriggle out of the gray matter). Standard MRI and fMRI are great for diagnosis, but it's tough to translate those images to the actual brain itself on the operating table. Fortunately, recent years have seen the development of some excellent image-guidance systems for neurosurgeons to help them see exactly what they're doing -- even if they can't see much with the naked eye. The latest technology is a kind of "GPS for the brain" developed by researchers at Rush University Medical Center that helps neuroendovascular surgeons treat the delicate blood vessels in the brain much faster, with less risk, because the 3D CT imaging and interoperative software means they can see the vessels and surrounding brain tissue in much more detail than before. In fact, they can even rotate the image to view it from several different angles, as needed. It will most likely save a few lives of stroke victims, and might also enhance treatment for aneurysms and narrowed arteries. Neuroendovascular surgery is a tricky thing. The surgeon inserts a catheter into the patient's femoral artery -- that's right, the big one in the leg -- and then threads tiny instruments up through the artery all the way to the brain vessels. Needless to say, you really don't want him/her making a wrong turn along the way, or veering even momentarily off the road. The new system produces a translucent 3D image that enables the surgeon to watch his own progress in real time, and visualize the exact shape of the aneurysm, or the exact placement of a stent, for example. (I swear I saw some version of this employed on an episode of House.) It can also reveal complications that arise during the procedure, such as intercranial bleeding. They used to have to wheel the patient out of the operating room to the nearest CT scanner to check for complications; now they can monitor it right then and there. So science (especially, although not exclusively, physics) is doing quite a bit to help solve medicine's recurring image problems. Perhaps one day, there will be a significant breakthrough to improve the sad state of my hair. Oh lordy. Is that thing above mammogram spam???!? Nigerian lawyers I've gotten used to, but mammograms???? can you provide me the detials about visual mapping.